appointed and sworn in by the Minister of Justice to fulfill the duties of a notary, and as a person of public trust, ensures that his services secure the interests of clients and those taking part in acts in law. 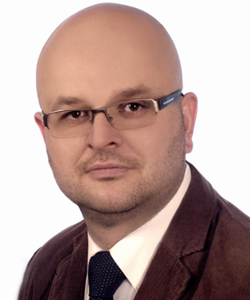 Notary Szymon Krzyszczuk runs his notarial office in a central district of Warsaw –ul. Chopina 5a lok 3 (2nd floor - elevator), where he reads out notarial deeds to clients, authenticates documents and certifies inheritance. Notary Szymon Krzyszczuk in Warsaw also has the qualifications of a state appointed certified translator of the English language (tłumacz przysięgły języka angielskiego). He passed the State Examination at the Ministry of Justice and therefore is authorized to perform all notarial duties both in Polish and English without participation of a certified translator of this language in accordance with article 2 § 3 of Notarial Law. He is also able to precisely offer advice in the English language in relation to services provided. In our notary office we offer mediation services performed by a notary deputy Anna Hupert-Gabryś. Anna finished many cources about mediations and have great skills to be an successful and effective mediator. In Poland every notarial act must be performed in the Polish language. If you do not have a good command of Polish, you cannot be a party to a deed in Polish, unless a state appointed translator is hired who will officially translate it for you into English before you sign it. Notaries cannot read out such deeds to you in English without a sworn translator’s assistance, unless they have the qualifications of sworn translators themselves. In the event there is rush, you do not know a trustworthy translator or otherwise, you can always phone our office and make an arrangement – we all speak English. You will not need to bring with you a sworn translator to have a notarial deed read out for you in English.